Now is the time to pick those leafy greens from the garden and make a fresh garden greens salad. And I hope you don’t mind that I mix in a lot of fresh fruits and top it with a homemade yogurt dressing. If you don’t have a garden, (or a friendly neighbor with a garden), just grab some spring mix greens from your local grocer. It’s all good. 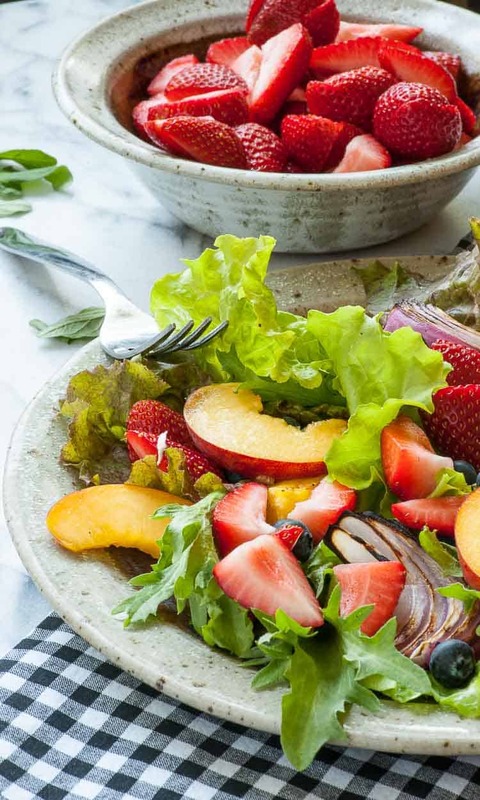 There is something about warmer weather that makes the idea of a light, low calorie salad like this seem appealing. Maybe it has to do with outdoor grilling. Oh yeah, I did just grill up some Brined Chicken Thighs and some Orange Glazed Shrimp. This salad would be a natural with either of these grilled meats. My daughter Josie planted a gourmet blend of leaf lettuces and some curly endive. I picked and cleaned a bunch of these two, then grabbed a couple sprigs of tarragon. The tarragon has a kind of sweetness that goes well with the other fruits. The tarragon was sprinkled on after the dressing as a kind of garnish…if you can actually call this a garnish on a fresh garden greens salad! 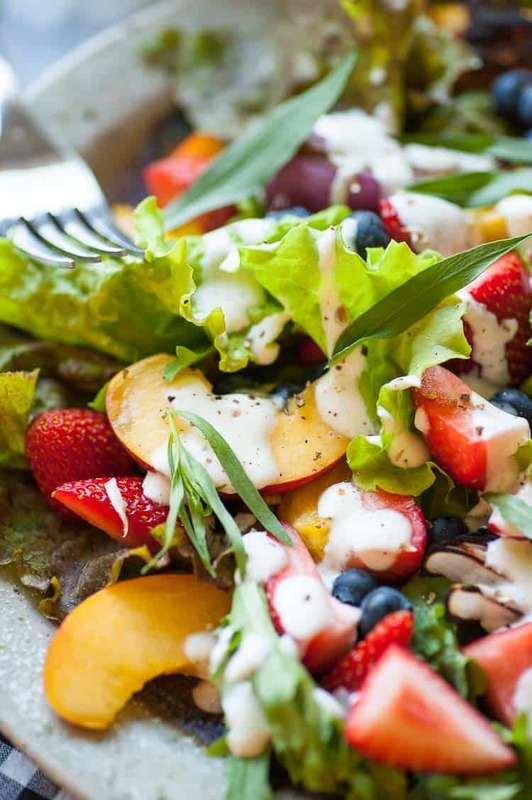 The dressing is a simple Greek yogurt recipe. I adapted it from a Dole recipe, (you know…the pineapple people). Their recipe called for 1/4 cups yogurt, 1 tsp. vinegar, 1 tsp evoo…yadda yadda. This is a salad dressing…it’s not rocket science. The recipe amounts are guidelines and I usually don’t measure ingredients for dressings but make an educated guess, mix it up and take a taste. And this one tasted great. Ok…the recipe card below has the ingredient amounts. 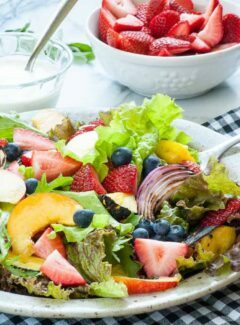 The fruits in the salad included: strawberries, blueberries, peaches, and some grill charred pineapple, and charred red onions. Use what you have on hand and make a freshly picked garden greens salad with homemade low calorie Greek yogurt dressing to top it off. 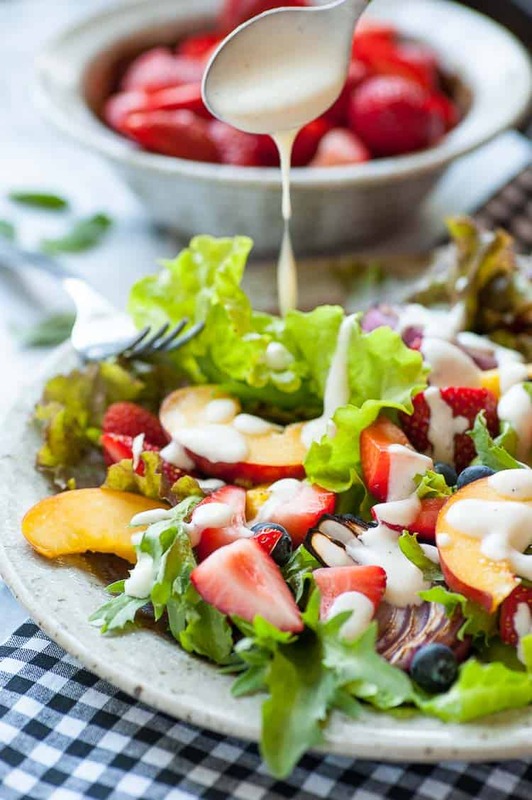 This is a salad with fresh spring mix greens, fresh fruit topped with a Greek yogurt dressing. 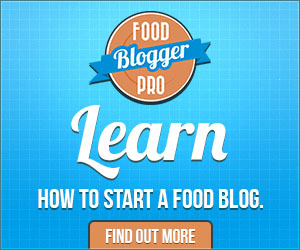 Whisk all ingredients in a small bowl. Add salt and pepper to your taste. Keep refrigerated until used. 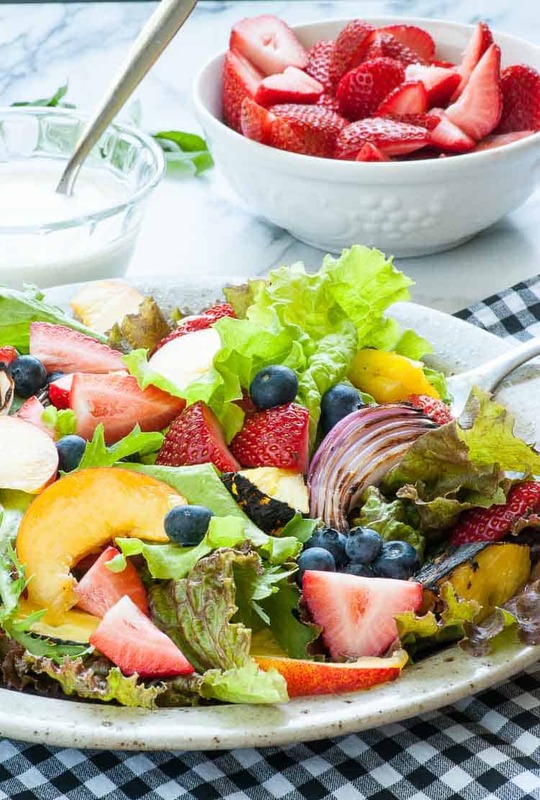 Mix greens and fruit in a large bowl or on individual serving dishes and serve with the yogurt dressing on the side. The nutrition label is for the dressing only, assuming 4 servings.